Product line choice is an important factor in determining the overall success of a manufacturer operating in a customer-oriented competitive market. A broader product line offers greater variety and caters to multiple segments of the market. 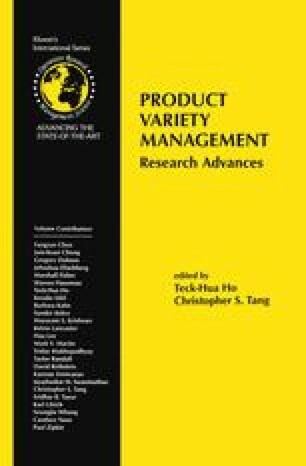 This enables a manufacturer to meet customer needs more closely leading to higher market share and greater revenues (Bagozzi 1986, and, Cravens and Woodsruff 1986). However, more variety may lead to an increase in the complexity of the manufacturing process thereby increasing operational costs (Abeggelen and Stalk 1985). On the other hand, a narrow product line is easier to manage from the manufacturing point of view but may not generate enough profits for the manufacturer to lead a successful business (Kotier 1986). Choice of the product line depends primarily on market characteristics, consumer preferences, operational cost and the manufacturer’s objectives.